An amniocentesis is a procedure used to sample a small amount of amniotic fluid from around the fetus. It is usually performed after 15 weeks’ gestation. It is performed for similar reasons to chorionic villus sampling (CVS), which is carried out from 10 -13+6 weeks’ gestation. It is not the fluid itself which is of use, but the fetal cells that are present in the fluid. In this article, we shall look at the procedure, indications and complications of amniocentesis. First, a local anaesthetic is used to decrease pain for the mother. 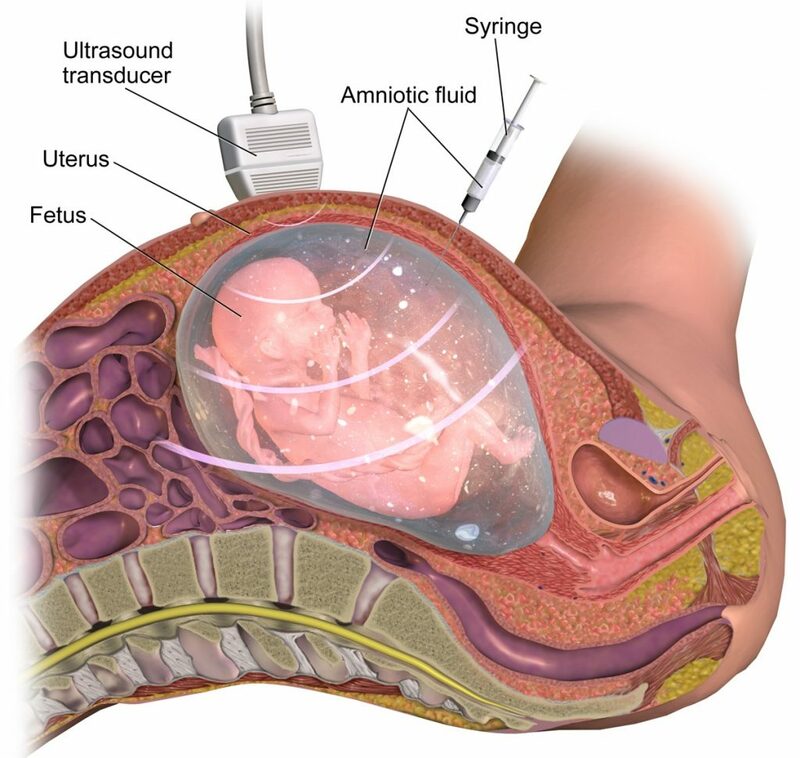 Under ultrasound guidance, a needle is passed through the mother’s abdominal wall and into the amniotic sac. The needle should not pass through the placenta unless absolutely necessary. A small amount of amniotic fluid is taken, and fetal cells are sent for karyotyping and/or PCR. Note: Rhesus-negative women will need Anti-D immunoglobulin after the test. The most common indication for amniocentesis is a “high risk” result from a first trimester screening test, or a previous pregnancy affected by a genetic condition. The fetal cells that are obtained can be tested for various chromosomal conditions, such as Down’s syndrome, Edward’s syndrome and/or Patau’s syndrome. Therefore, the intended benefit of this procedure is diagnosis or exclusion of particular genetic diseases. 1% risk of miscarriage (RCOG). The risk is higher if performed before 14 weeks gestation. False reassurance – a “normal” result may make women feel their baby will be born completely healthy when this may not be the case. The main alternative to amniocentesis is chorionic villus sampling. This is also an invasive procedure, with its own risks. It can come to the same conclusions as amniocentesis and is typically performed earlier in the pregnancy. Nuchal translucency (measured on ultrasound) and blood tests can give the woman some information regarding the risk of Down’s syndrome, but cannot provide definitive diagnosis or reassurance. What tissue is sampled in an amniocentesis? In the UK, when is an amniocentesis usually performed? Which of the following is the most appropriate indication for an amniocentesis? What is the main risk of amniocentesis? Which of the following tests is the main alternative to amniocentesis?